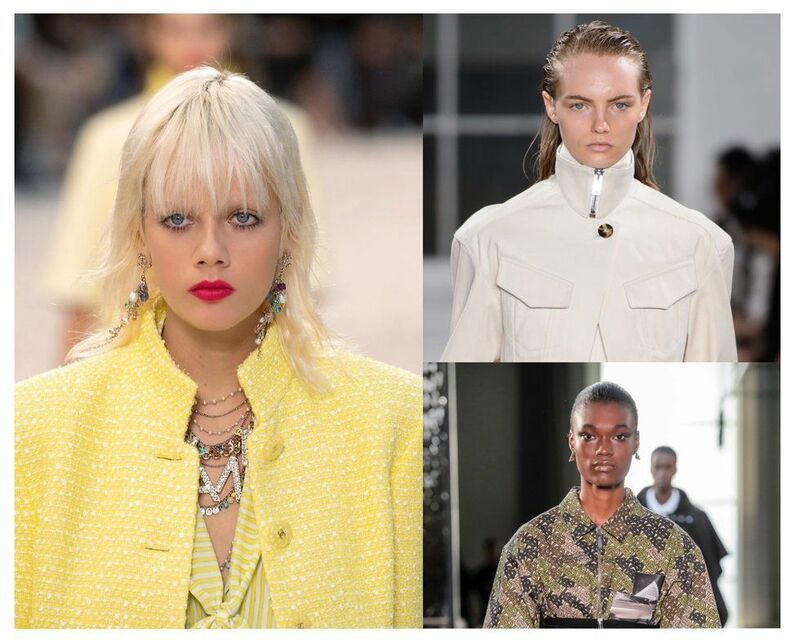 With the dust of 2019's spring/summer fashion month finally settling, we've been thinking a lot about our favorite beauty trends that emerged this season. From tin-foiled lips to braids and culturally specific hairstyles actually making a full-fledged high fashion appearance, the vast range of trends spotted on this season's runways proved that the dismantling of beauty boundaries in fashion has officially begun. And just as there was plenty of variety when it came to hair, nails and makeup, so too did the catwalk finally feel home to greater diversity and intersectionality, with more ages, skin colors, hair types and body types than it seems we've seen previously. (There was even a pregnant model—hey Slick!) While fashion still has a long road ahead before it's truly an industry that welcomes all types, this season felt like a positive step in the right direction. Glitter and diamonds were definitely a girl's best friend this fashion month. 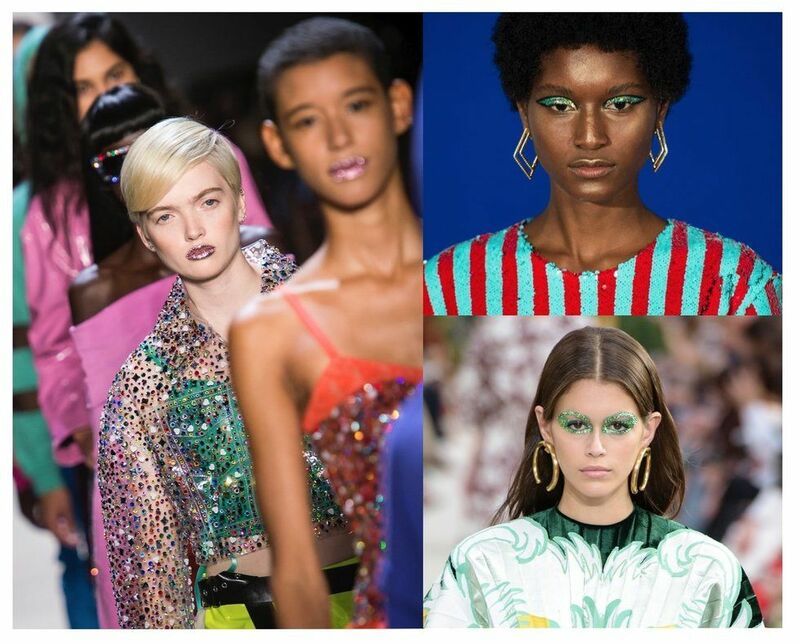 Whether it was Isamaya Ffrench's glittery, mod eyelids at Halpern, Heather Reynosa's diamond thimble claws at Libertine, popping lips for Jeremy Scott by Kabuki, or Paul Hanlon's glitter hair at Giambattista Valli, we left more than convinced that what glitters is always gold. Oh and let's not forget, Pat McGrath's magnificent rhinestone-kissed eyes for Valentino. A fresh canvas is every makeup artist's dream and that's just what models were this season. 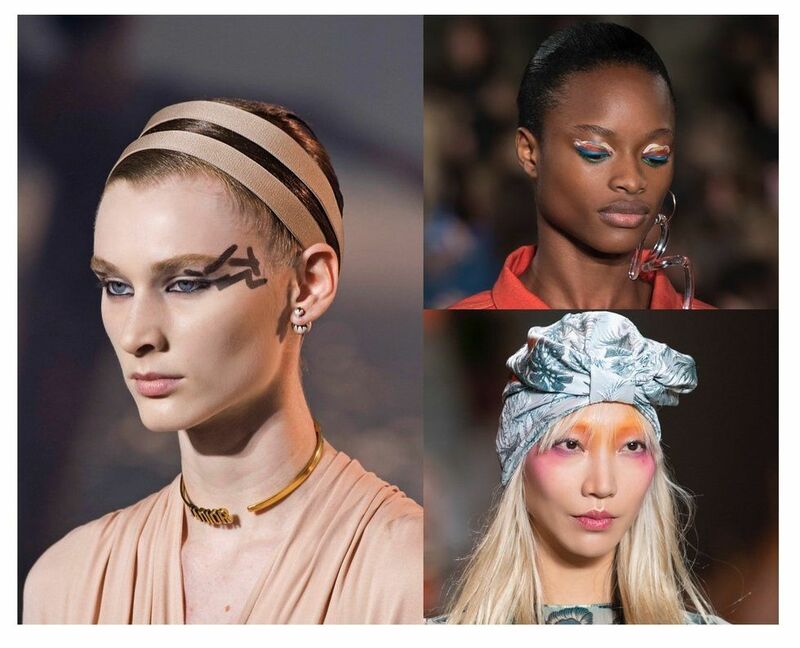 Unlike the usual graphic liners with defined beginnings and clear endings, artists like Pat McGrath and Peter Phillips at the Anna Sui and Dior and Dries Van Noten shows, respectively, took a different approach by using free form brush strokes that showcased creative freedom and nuanced beauty. When it comes to these looks all we can say is yes. Braids and other types of protective hair styles that many women of color have worn for ages haven't always had a place in the luxury fashion world. That changed this season. 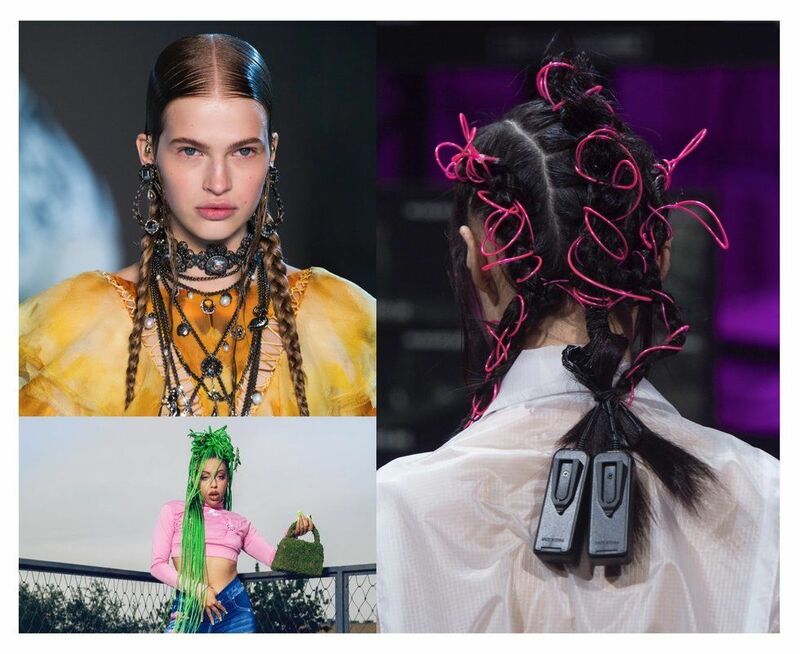 Shows like Gypsy Sport, Alexander McQueen, Savage X Fenty embraced long, neon green and earth tone beaded box-braids, sleek three-strand braids, and a chunky dutch braid for the win. Legendary hairstylist and Princess Diana's tress maven, Sam McKnight, also brought a futuristic take on the timeless French braid for Nicholas Kirkwood, making it clear that form and function can indeed combine in luxurious new ways. Chanel and Chloé also weren't too far behind, embracing natural hair cornrows in Paris. 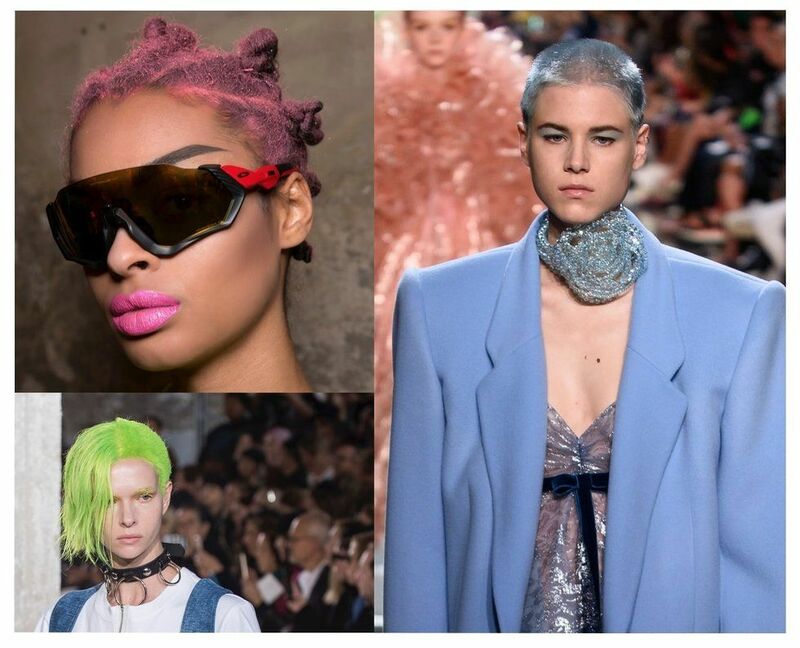 It wasn't just bold braids that ruled the runways—color took a vibrant, front-and-center turn at shows like Marc Jacobs, where hair stylist Josh Wood dyed models' hair shades of pastel blues, pinks, greens and vibrant oranges. Elsewhere, Ashley Williams worked with McKnight to achieve frosted purples, yellows and hot pinks, coupled with an ode to 90s Troll Dolls. Meanwhile, Nicopanda made a bold statement and let us know that natural-haired girls do have a place in fashion, featuring a pink bantu knots look on the runway. Beachy, windswept hair paired with soft, natural skin dominated runways from Proenza Schouler, who showed off clean skin enhanced by their new makeup collaboration with Lancome, to Burberry, who kept it polished with a mixture of dewy skin and soft winged liner by Pat McGrath, while Guido Palau kept hair softly tucked away into low buns. Sam McKnight took beach glam to Paris for Chanel, with luxurious undone waves while Chloé followed suit with bohemian, effortlessly tousled hair and lightly bronzed skin. 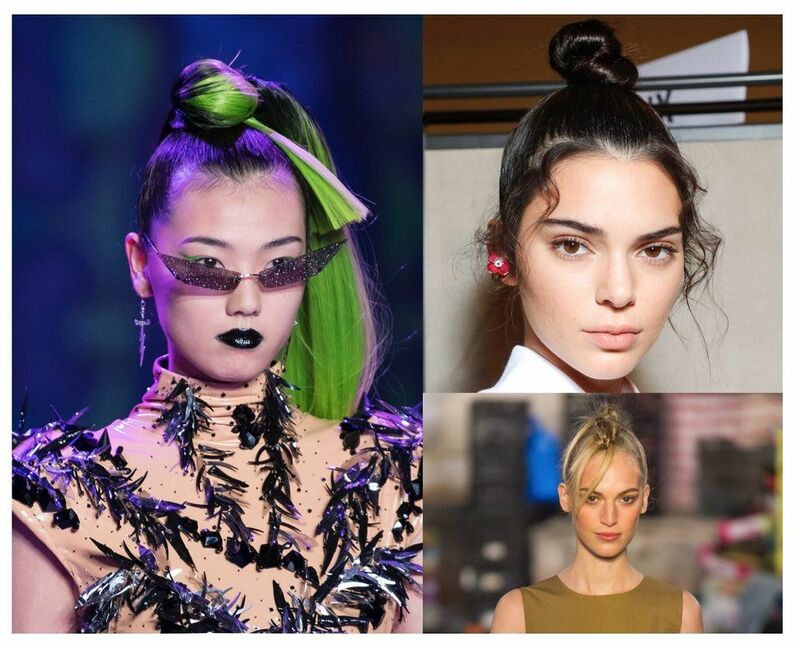 Who doesn't love a sleek top knot? Fendi, Molly Goddard, and The Blonds all managed to pull off this classic look while also putting their own spins on it. McKnight for Fendi took his top knot and finished it off with soft face-framing baby hairs while models at Molly Goddard's show came through with a twisted knot that was left hanging over the forehead. The Blonds on the other hand, added long purple, red, green and even platinum and black extensions to theirs, giving us an ombré pony that you could whip. 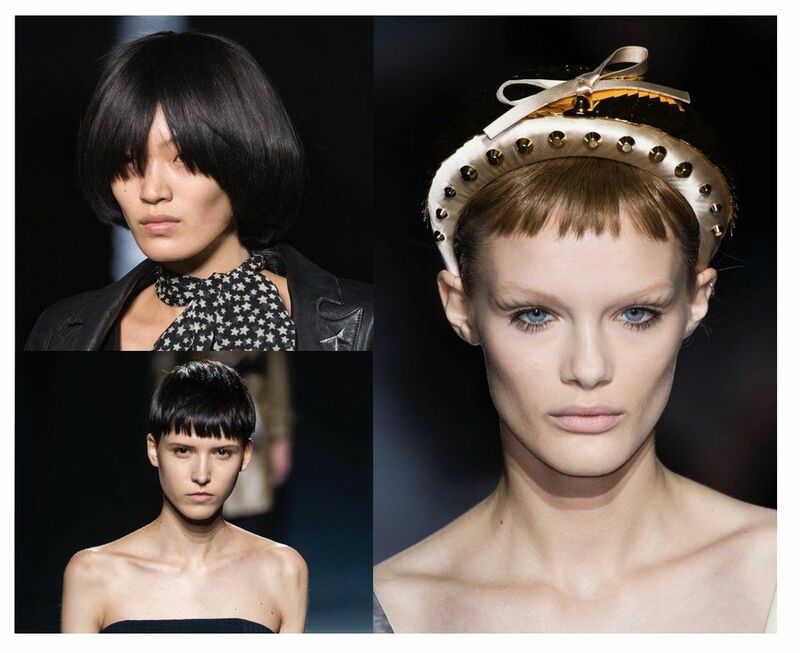 Subversive, boyish, dramatic haircuts popped up at Givenchy and Prada, who both worked with the legendary Guido Palau to create retro microbangs and androgynous pixie cuts. Saint Laurent partnered with hairstylist Duffy to create a diverse set of looks, from dramatic bowl cuts to sharp, eye-covering bangs. Finally, Hedi Slimane's Céline show did not disappoint in the retro beauty department, featuring vintage-inspired, wavy unisex lobs and soft short curls. 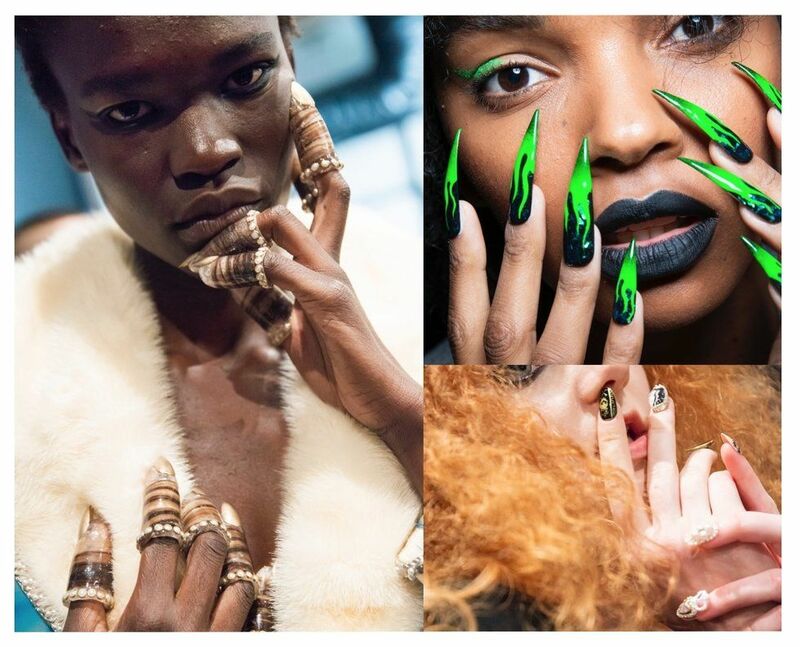 From Rodarte's three-dimensional, crystal-embellished silver and gold metallic manicures to Libertine, The Blonds and Adeam's ornate manicures decorated with pearls, gemstones and gold beads, several shows this season took nail opulence to new lengths. 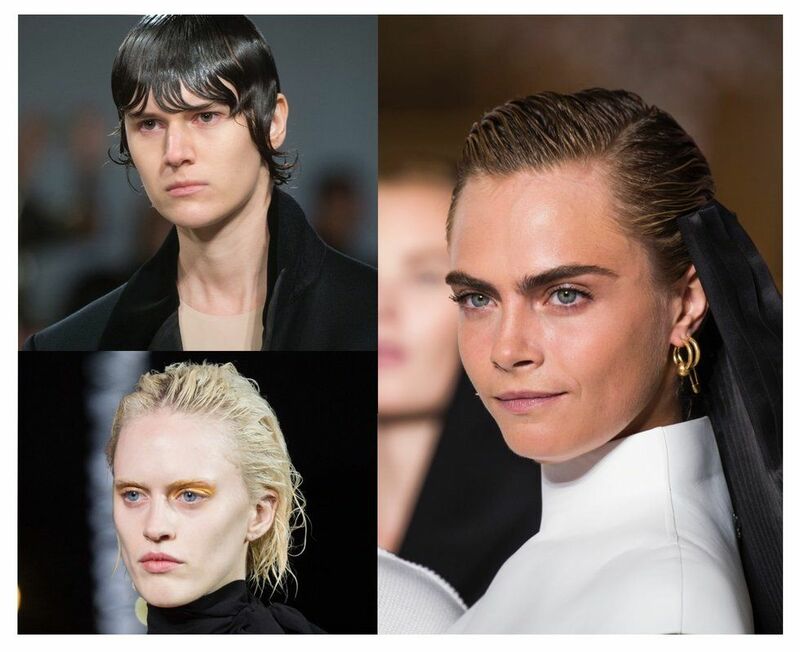 Slicked, wet-looking hair has had its fair share of fashion week moments and this season proved to be no different. In London, Ashish had models drenched in water backstage to achieve an authentically wet look and styled with stringy damp hair guarding their faces. Rochas, Saint Laurent and Margiela similarly kept models in stringy, soggy hair, but loosely pulled it back. Balmain and Dior, meanwhile, kept wet hair neat and tightly slicked away from the face. For many brands, the biggest statement on the runways seemed to be coming from models' heads. Ashley Williams styled her models with sky-high, slicked ponytails decorated with signature slogan hair clips. Dolce & Gabbana and Rodarte models sported bouquets of flowers atop their hair. 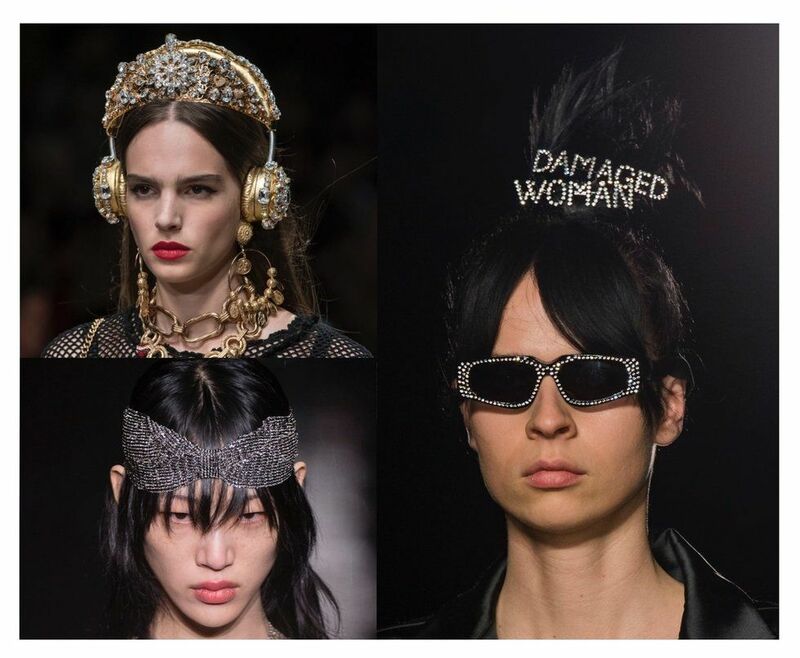 Gucci kept things slightly more conventional with wide brimmed hats, headbands, and dramatic diamante tiaras while Chanel and Miu Miu added feminine touches with rhinestone bows, headbands and brooches. Saint Laurent embellished models' heads with metallic, mesh headbands.